The SLX 350 OB is all new for 2017 and it’s a big boat for big water that rides and responds like a small runabout. I tested one of the very first hulls in the water in southwest Florida. While 350 Verados are an option, after testing with the 300s and easily cracking 60 mph, that seemed plenty fast enough for me. This thing scoots! When you go full lock on the wheel into a turn, the banking is insane. In fact, it was almost too much the first time. It’s something you could dial in if you want or, of course, you don’t have to go full lock into a high-speed turn. There’s always that simple solution, right? The most economical cruise is around 32 mph but anywhere in the 30s and 40s was quiet and smooth, thanks largely to the QuietRide system which reduces noise and vibration by up to 50%. The new Verados are so quiet. Even with 900 horses whirring away and ripping across the Gulf of Mexico, the wind is often the loudest part of the ride. The helm is a high-end digital dash with chartplotter, Dynamic Display and joystick piloting. 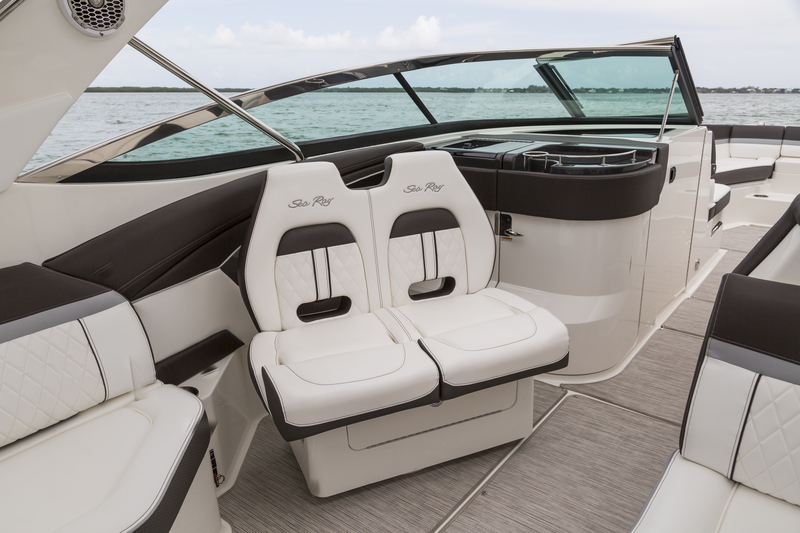 The riders have a myriad of seating options from the huge bow lounge to the passenger seats to the aft bench opposite the wet bar. Above, the hardtop extends out from the arch offering good protection while not inhibiting standing room or sightlines. 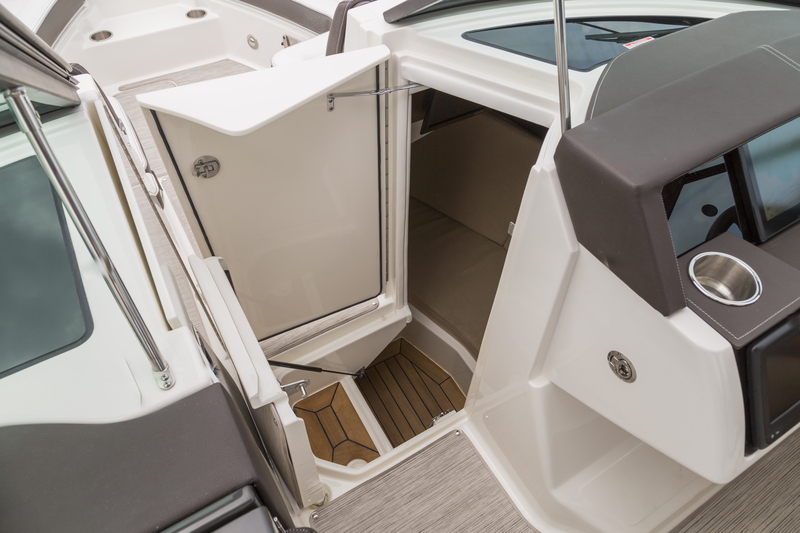 The sunroof opening allows light through or, closed, it combines with the optional sunshade that extends well aft to cover almost all the boat. The storage is unreal, though given the size of the boat makes sense. It just seems wild because the lines are so sleek and stylish and this does not look like a huge barge of a day boat. In fact, unless it’s beside another boat in the marina you don’t really know how big it is. I think that’s a good thing—and hard to achieve—but they managed. 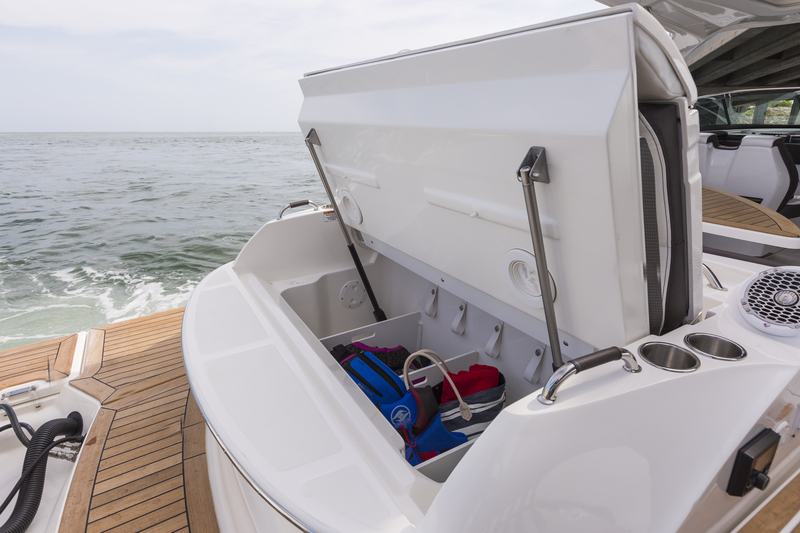 There are two cooler storage spaces, and thanks to outboard power the space that could be chewed up with sterndrive motors is cavernously available. 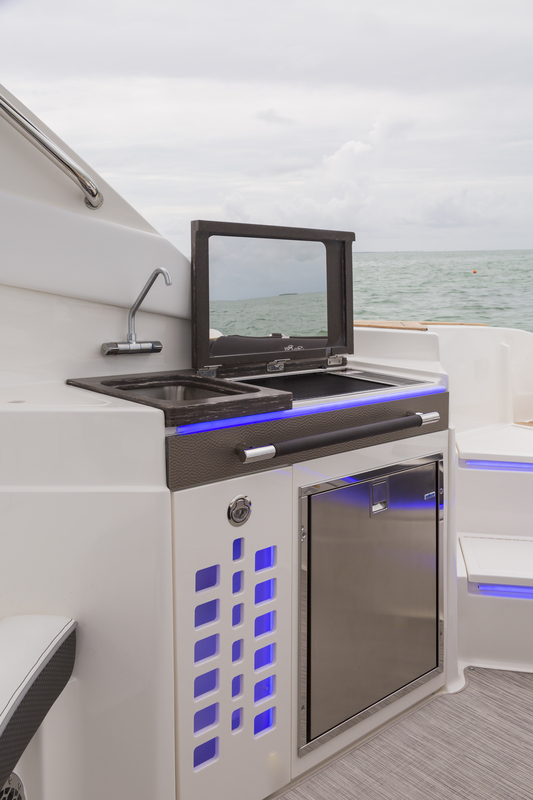 There is a portside head compartment with a fibreglass, lockable door featuring VacuFlush toilet, solid surface countertop with sink and pull-out sprayer. Opposite is the starboard helm compartment that you can enhance with a berth upgrade. It includes cushions and a TV that would be great for kids to get a break from the elements or have a nap. Big day boats aren’t for everyone. If you’re on big water and have a lot of friends or family and refuse to leave anyone, or any fun, behind, something like the 350 SLX may check all your boxes.